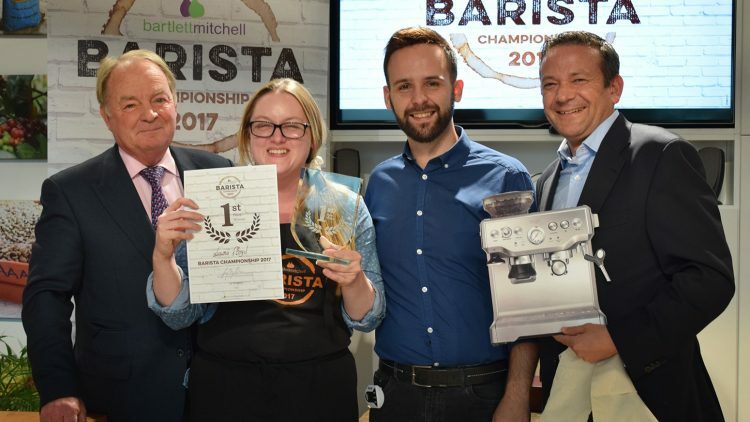 bartlett mitchell, one of the UK’s leading independent caterers, has today named Laura Floyd as the winner of its first-ever barista championship. Laura, who works at a regional bartlett mitchell client site, saw off stiff competition from six other finalists to take the title of Barista Champion 2017. Held last night at Bewley’s, bartlett mitchell baristas from across the UK were assessed on their coffee knowledge, grinding skills, coffee machine use and milk preparation techniques. The judges, which included Dayana Coppini, trainer for Bewley’s and a UKBC competitor; Vince Spadaro and Nicolay Rangelov both trainers for Bewley’s, and Lara Hunter-Rodwell; head of training for Bewley’s in the South, were particularly impressed by Laura’s level of preparation and attention to detail. Commenting on her win at the inaugural barista competition, Laura said: “It’s still a shock to have won, I still can’t believe it. It was a great challenge. I did stress about the competition all the way through, but I’ve noticed how much I have improved. This journey has pushed me to do more, learn more not just about coffee making, but where it comes from and why it tastes different. Consisting of two heats and a final, the competition was held at a bartlett mitchell site in London and a partner venue in High Wycombe. To assess a broad spectrum of barista skills, the competition was structured in three stages: an espresso course, a cappuccino course, and a freestyle course that allowed competitors to present a signature drink to the judges. Coffee is now a major part of the company’s growth strategy. Developed by bartlett mitchell’s coffee brand manager Miguel Camara, the competition further strengthens the caterer’s commitment to refining its coffee offer, adding to the significant resource already invested in developing its products and services. Last year, the company launched Perkee, its own premium sustainable coffee. Since then, it has sold more than 500,000 cups in participating sites, making it the most popular coffee across its portfolio. As part of a collaboration with Soppexcca, a Nicaraguan-based co-operative, the coffee was first launched during Fairtrade Fortnight last year, with the aim of providing customers with a unique, ethical and tasty coffee. Wendy Bartlett, executive chairman, bartlett mitchell, added: “We are really pleased with our first championships. We’ve seen some fantastic talent on show and we’re incredibly proud of all our finalists, and competitors in the previous heats. “The standard was very high, which is testament to the way Miguel Camara, our coffee brand manager’s drive and leadership has inspired all our baristas so that they felt ready to enter the competition.